Zirconium (Zr) is an important alloying element to Mg-Zn-based alloy system. In this paper, we report the formation of the β-type precipitates on the nanoscale Zr-rich particles in a Mg-6Zn-0.5Cu-0.6Zr alloy during ageing at 180°C. 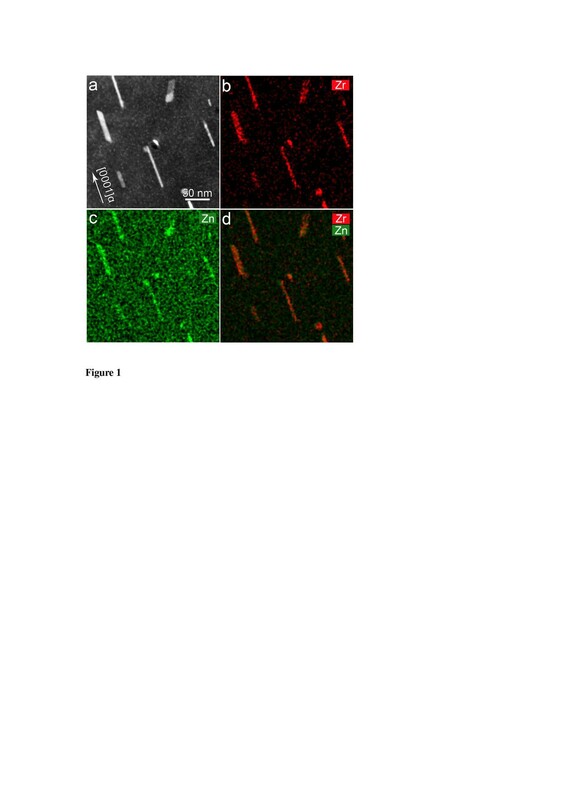 Scanning transmission electron microscopy examinations revealed that the nanoscale Zr-rich α rods/laths are dominant in the Zr-rich core regions of the as-quenched sample after a solution treatment at 430°C. More significantly, these Zr-rich particles served as favourable sites for heterogeneous nucleation of the Zn-rich β-type phase during subsequent isothermal ageing at 180°C. This research provides a potential route to engineer precipitate microstructure for better strengthening effect in the Zr-containing Mg alloys. Mg-Zn-based alloys have attracted considerable attention due to their pronounced age-hardening effect [1–5]. The key strengthening precipitates in this alloy system have been considered as two types of Zn-rich precipitates, the rod-like β1′ precipitates perpendicular to the (0001)α plane and the plate-like β2′ precipitates parallel to the (0001)α plane [1–5]. Hardening by precipitation of β-type precipitates is believed to be the main strengthening mechanism of Mg-Zn-based alloys . Recently, a peak-aged Mg-6Zn-0.5Cu-0.6Zr cast alloy has been reported to possess excellent mechanical properties with an ultimate tensile strength of 266.3 MPa, a 0.2% proof yield strength of 185.6 MPa and an elongation of 16.7% . Both the strength and ductility of the newly designed Mg-6Zn-0.5Cu-0.6Zr alloy are superior to those of the traditional Mg-6Zn-xCu-0.5Mn alloys [5, 6]. Since Zr-rich particles may form after a solution treatment in Zr-containing Mg alloys [2, 7, 8], the present research aims to unveil the effect of these pre-existing nanoscale Zr-rich particles on the formation of the subsequent β-type precipitates of the Mg-6Zn-0.5Cu-0.6Zr alloy during age hardening. The alloy with a nominal composition of Mg-6Zn-0.5Cu-0.6Zr (wt.%) for this study was prepared by melting high-purity Mg and Zn with Mg-28.78 wt.% Cu and Mg-31.63 wt.% master alloys, in a steel crucible and by casting into a permanent mould under an Ar atmosphere. Samples sectioned from the ingot were solution-treated for 24 h at 430°C. To investigate the microstructural evolution of the Zr-rich and Zn-rich precipitates, the water-quenched samples were subsequently aged in an oil bath for 20 and 120 h at 180°C. 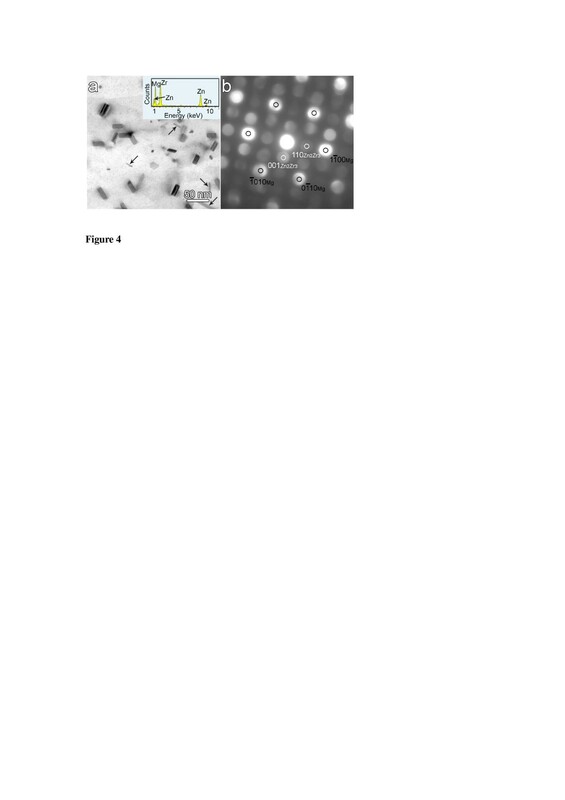 Thin foil specimens for scanning transmission electron microscopy (STEM) and transmission electron microscopy (TEM) were prepared by a twin-jet electropolisher using a solution of 10.6 g LiCl, 22.32 g Mg(ClO4)2, 200 ml 2-butoxi-ethanol and 1,000 ml methanol at about −45°C and 70 V. The STEM study was conducted using a JEOL 2200FS microscope (JEOL Ltd., Tokyo, Japan) equipped with a high-angle annular dark field (HAADF) detector and a Bruker energy dispersive X-ray spectrometer (EDXS) detector (Bruker AXS, Karlsruhe, Germany). The conventional TEM analysis was carried out using a JEOL 3000F microscope equipped with an Oxford EDXS detector (Oxford Instruments, Oxfordshire, UK). Figure 1 shows the 1 2 ¯ 10 α HAADF image and the corresponding EDXS map of the as-quenched sample after a solution treatment at 430°C for 24 h. Most particles in the Mg matrix are predominantly rods/laths elongated along the α direction, with a length of 50 to approximately 200 nm, although a few particles are elongated along other directions. The rod/lath morphology of these particles was confirmed by further large-angle tilting experiments. 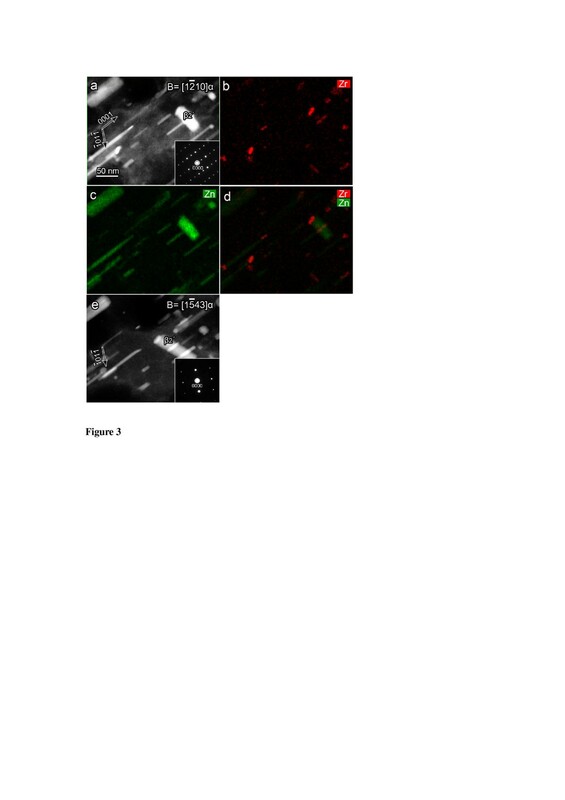 The Zr map, Zn map and a combined Zr and Zn map, as shown in Figure 1b,c and d, reveal that all rod-like particles in bright contrast in Figure 1a are enriched with Zn and Zr. This is in good agreement with the previous reports showing that Zr-rich phases exist in various Zr-containing Mg-Zn-based alloys after a solution treatment [2, 7, 8]. EDXS analysis detected no enrichment of Cu in the Zr-rich particles. Alloy quenched after a solution treatment at 430°C for 24 h. The incident electron beam was parallel to 1 2 ¯ 10 α . (a) HAADF image, (b) Zr EDXS map, (c) Zn EDXS map and (d) a combined EDXS map of Zr and Zn. In order to investigate the effect of these pre-existing Zr-rich particles on the formation of Zn-rich strengthening precipitates during subsequent isothermal ageing, HAADF imaging and EDXS mapping were conducted on samples aged at 180°C for different time. The 1 2 ¯ 10 α HAADF image of the 20-h-aged sample, as shown in Figure 2a, reveals that a dispersion of particles was mostly elongated along the α direction, with only one marked β2′ perpendicular to the α direction. After tilting a large angle of approximately 51° to the 0 1 ¯ 11 α zone axis (Figure 2e), all particles observed in Figure 2a were found to be separate without overlapping with each other. The β2′ precipitate, marked in Figure 2a, is a plate containing a brighter core, which corresponds to an enrichment of Zr (Figure 2b). The Zr map, Zn map and a combined Zr and Zn map, as shown in Figure 2b,c, and d, demonstrate that most of the elongated particles were composites containing a Zn-rich part and a Zr-rich segment. Careful examinations of the EDXS maps and the HAADF image confirmed that each Zr-rich segment was located either at the end or in the middle of an individual elongated precipitate. Therefore, we conclude that those Zr-rich segments of the precipitates are, in fact, the remains of the Zr-rich particles initially present in the as-quenched condition. We further deduce that these Zr-rich particles served as a precursor phase for the heterogeneous nucleation of Zn-rich β1′ precipitates (α rods) and β2′ precipitates ((0001)α plates) in the Zr-rich core regions of the Mg alloy during subsequent ageing. Alloy aged at 180°C for 20 h. The incident electron beam was parallel to 1 2 ¯ 10 α in (a-d) and 0 1 ¯ 11 α in (e), respectively. (a) 1 2 ¯ 10 α HAADF image, (b) Zr EDXS map, (c) Zn EDXS map, (d) a combined EDXS map of Zr and Zn and (e) 0 1 ¯ 11 α HAADF image. Figure 3 shows the HAADF image and the corresponding EDXS mapping result of the 120-h-aged sample. Both the length of α β1′ rods and the thickness of (0001)α β2′ plates grew significantly with the ageing time. The Zr map, Zn map and a combined Zr and Zn map, as shown in Figure 3b,c and d, indicate that many β1′ rods and the β2′ plate contain a Zr-rich segment. The sizes of Zr-rich segments observed in the 120-h-aged sample are smaller than those observed in the 20-h-aged sample. It appears that the size of the Zn-rich segments gradually increased at the expense of the Zr-rich segments during the isothermal ageing. After tilting approximately 36° from the 1 2 ¯ 10 α beam direction, a 1 5 ¯ 43 α HAADF image (Figure 3e) further confirms the existence of the Zr-rich segments in the Zn-rich precipitates. All experimental evidences above indicate that the heterogeneous nucleation on the pre-existing Zr-rich particles is significantly important for the formation of Zn-rich precipitates (β1′ and β2′) in the Zr-rich core regions of the Mg alloy during ageing at 180°C. Alloy aged at 180°C for 120 h. The incident electron beam was parallel to 1 2 ¯ 10 α in (a-d) and 1 5 ¯ 43 α in (e), respectively. (a) 1 2 ¯ 10 α HAADF image, (b) Zr EDXS map, (c) Zn EDXS map, (d) a combined EDXS map of Zr and Zn and (e) 1 5 ¯ 43 α HAADF image. To explore the crystallographic characteristics of these Zr-rich α rods, we examined the as-quenched microstructure using TEM with the beam parallel to the α direction, as shown in Figure 4. Most of the Zr-rich particles (>80%) of the as-quenched sample in Figure 4a have a low aspect ratio in the range of 1:1 to approximately 1:3 and a thickness in the range of 6 to approximately 12 nm with their long side, which is less than 25 nm, parallel to the < 11 2 ¯ 0 > α directions. 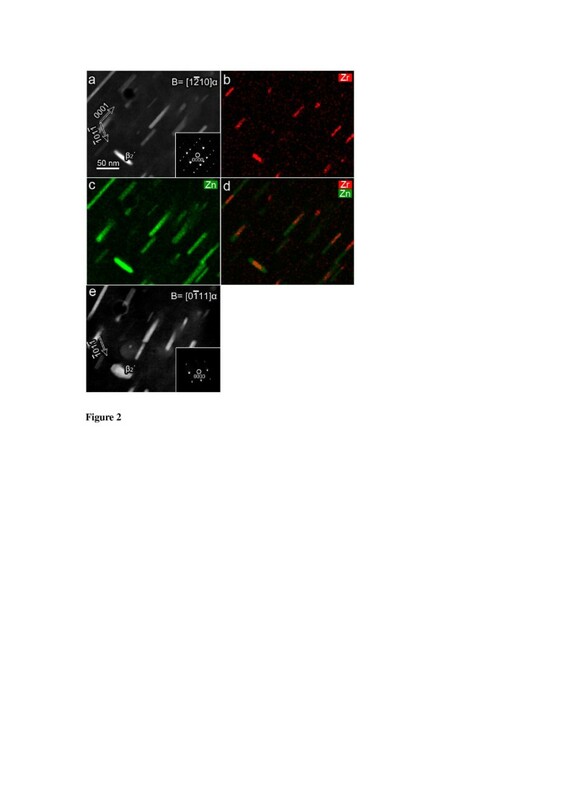 They are Zr-rich α rod/lath particles observed previously by STEM examinations (Figure 1a). The rest of the Zr-rich particles (<20%), marked with black arrows in Figure 4a, are thin rods with aspect ratios of 1:3 to approximately 1:20 and a thickness of 2 to approximately 5 nm, with their long axis approximately 23° away from the < 11 2 ¯ 0 > α directions. They are similar to the type C Zr-rich rods reported by Gao et al . In contrast, the size and aspect ratio of the dominant Zr-rich α rods/laths in the end-on view are significantly different from the Zr-rich < 11 2 ¯ 0 > α rods reported by Gao et al . This difference is possibly due to the different alloy systems and the heat treatment techniques. The nanoscale Zr-rich  α rod-like precipitates in the solution-treated alloy. (a) α TEM micrograph and the EDXS spectrum (inset), and (b) micro-beam electron diffraction pattern. Chemical microanalysis of these α rods using EDXS indicated that the atomic ratio of Mg:Zn:Zr was about 51:19:30 (inset, Figure 4a), suggesting that these α rods were Zr-rich precipitates with a Zn:Zr ratio close to 2:3. The corresponding micro-beam diffraction patterns (Figure 4b) confirm that these Zr-rich α rods have a tetragonal structure similar to that of Zn2Zr3 δ phase (a = b = 7.633 Å, c = 6.965 Å, α = β = γ = 90 [8, 9]). The orientation relationship (OR) implied by the superimposed precipitate and matrix patterns was such that 1 1 ¯ 0 δ / / 0001 α 110 δ / / 1 1 ¯ 00 α and 001 δ / / 1 ¯ 1 ¯ 20 α . By combing the commonly reported OR between β1′-MgZn2[3, 10] /β1′-Mg4Zn7[11, 12] and α-Mg matrix with the OR of the δ-Zn2Zr3 phase determined in this work, the possible ORs and the crystallographic disregistries between δ phase and β1′ phase were determined and listed in Table 1. The inter-planar misfits between the matching planes 001 δ − Z n 2 Z r 3 / / 0001 β 1 ′ − M g Z n 2 001 δ − Z n 2 Z r 3 / / 12 ¯ 70 β 1 ′ − M g 4 Z n 7 110 δ − Z n 2 Z r 3 / / 630 β 1 ′ − M g 4 Z n 7 and the directional misfits along the matching directions 1 1 ¯ 0 δ − Z n 2 Z r 3 / / 11 2 ¯ 0 β 1 ′ − M g Z n 2 1 1 ¯ 0 δ − Z n 2 Z r 3 / / 001 β 1 ′ − M g 4 Z n 7 were calculated as 2.5%, 5.4%, 5.1% and 3.2%, 1.8%, which are less than the critical values of 6% and 10% given in the edge-to-edge matching model . The low lattice mismatch between these two phases explains why β1′ rods form directly on the end plane (001)δ of the Zr-rich rods, as shown in Figures 2 and 3. The presence of the initial Zr-rich phases can provide much lower activation energy barrier and a favourable crystallographic correlation for the nucleation of the subsequent Zn-rich precipitates according to the classical nucleation theory . It is a significant finding that the Zr-rich phases can act as the precursor phase for the heterogeneous nucleation of Zn-rich β-type strengthening phases in the Mg alloy, given that the Zr-rich core region is a major microstructural feature of Zr-containing Mg alloys [7, 8]. By effectively engineering Zr-rich α rods in the Zr-rich cores of Mg alloys using a solution treatment, the formation of α β1′ rods could be promoted according to the heterogeneous nucleation mechanism revealed by this research. In summary, we have demonstrated that the nanoscale Zr-rich α rods/laths were predominant in Zr-rich core regions of the Mg-6Zn-0.5Cu-0.6Zr (wt.%) alloy after a solution treatment at 430°C. The nanoscale Zr-rich particles served as a precursor phase for the heterogeneous nucleation of the Zn-rich β-type strengthening precipitates during subsequent isothermal ageing at 180°C. These results are important for controlling Zr-rich particles in the Zr-rich core regions for enhancing the overall strength of the Mg alloy. This project was supported by the National Basic Research (973) Program of China (no. 2009CB623704), Nature Science Foundation of Guangdong Province (no. 07006483), the Doctoral Scientific Research Foundation of the University of South China (no. 2011XQD26), China Scholarship Council and the Australian Research Council Centre of Excellence for Design in Light Metals. ZL acknowledges the funding support by the Australian Research Council (DP0881700). The authors also acknowledge the facilities and scientific and technical assistance from AMMRF at the University of Sydney, particularly, Dr. Dave Mitchell and Dr. Ting-Yu Wang. HZ conducted all the experiments and drafted the manuscript. GS, JL and CL designed the experiments and supervised the whole study. HWL and CW participated in the measurements and data analysis. RZ helped in the experiments and characterization. ZL and SPR provided the financial and technical support to the study. All the authors read and approved the final manuscript.